Bollywood actor Kartik Aaryan is not only known for his chocolate boy looks, but also for his sense of style. 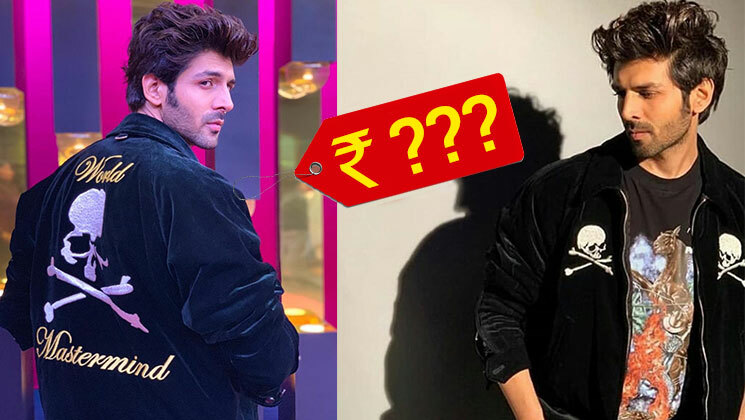 The ‘Pyaar Ka Punchnama‘ actor, who is all set to mark his debut on Karan Johar‘s much loved chat show ‘Koffee With Karan 6’, has made a cutting-edge style statement on it. The actor has been making heads turn with his cool and fashionable stuff at each outing he makes. Be it a dinner date or an awards night or airport look, he manages to grab eyeballs. So will his debut on Karan’s show be any different? No, he managed to slay one and all with his velvet jacket. Kartik was seen in an embroidered skull zipped jacket by Mastermind Japan. The jacket is special, not only for the skull pattern on the back but also because of the high price tag associated with it. The classy jacket costs a whopping 4,494 Pounds, which when converted to Indian currency, comes close to Rs. 4 Lakhs. We love the skull pattern on the front and the letters on the back. Are you looking forward to Kartik Aaryan and Kriti Sanon‘s debut on ‘Koffee With Karan’? Kartik Aaryan, whose last flick ‘Sonu Ke Titu Ki Sweety’ managed to earn over Rs 100 crore at the box office, will next be seen in ‘Luka Chuppi’ with Kriti Sanon. The light-hearted comedy is being produced by Dinesh Vijan and directed by Laxman Utekar. The film also stars Aparshakti Khurana, Pankaj Tripathi and Vinay Pathak. It will be releasing on March 1, 2019.